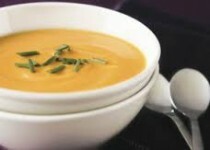 This smooth, creamy soup gets its velvety texture from pureed sweet potatoes and cream cheese. 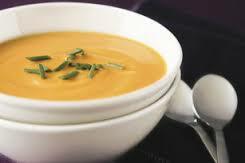 Serve our Roasted Sweet Potato & Garlic Soup alongside a toasted baguette and a tossed green salad and you got yourself a delicious meal! Toss potatoes, onions and garlic with oil; spread onto foil-covered rimmed baking sheet. Bake 1 hour until vegetables are tender; spoon into large saucepan. Stir in broth. Bring to a boil on medium-high heat. Remove from heat; cool slightly. Add to blender, in batches with cream cheese product; blend until smooth. Return to saucepan. Cook on medium heat 5 minutes or until heated through, stirring occasionally. Serve topped with chives.